Online Job Search Advice, Food Manufacturing Jobs, Food Manufacturing Recruitment, Food Careers. Although the Food Industry has been less affected by the downturn than other sectors, employers are still behaving cautiously with regard to headcount and we have seen more thought going into recruitment decisions. In this climate we are advising Job seekers to be more proactive and use some of the Free online resources that are available to them, over and above the usual job boards. What type of job am I seeking? What level of salary am I seeking? How far am I prepared to commute? Am I prepared to work shifts or weekends? Is there a particular sector of the Food industry that I want to work within? Is there a sector of the Food industry that I want to avoid? Am I better suited to a corporate culture or do I prefer working for smaller family-type enterprises? What type of work do I enjoy? What type of work am I truly gifted at? What are my work capabilities and limitations? Be clear on what you are seeking from your next role. This will stop you applying for online vacancies that you are not really interested in. Online applications can be made in a couple of clicks in a matter of seconds and it is tempting to apply ‘far and wide’ for vacancies. This is not recommended. You will send confusing messages to recruiters if you apply for a £50k job one day and a £25k job the next. Likewise, if you apply for a vacancy online and are selected for interview but decline due to the location/type of company, you will leave the recruiter perplexed and wondering why you applied for the job in the first place. 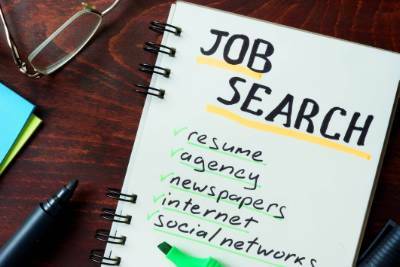 Having a clear job searching strategy will help you focus on what you really want and reduce the likelihood of applying the ‘scatter gun’ approach to job searching which is better avoided. As a job seeker you need to be proactive and it is important you get yourself on the radar of the recruiting manager. Networking used to take place on the golf course or at breakfast meetings, but the internet has opened it up and there is no better place to start than LinkedIn, the networking site for professionals. A basic account with LinkedIn is free and if used correctly can be a powerful tool in your job searching arsenal. You can add contacts such as current and past work colleagues; you can ask your contacts to introduce you to their connections. You can seek out hiring managers and even add a PowerPoint presentation detailing a project you have successfully completed or demonstrate your skills in a previous role. Groups are the engine room of LinkedIn and we would recommend joining relevant Food Industry groups where you can enter discussions, view jobs, catch up with ex-colleagues and let relevant people know you are available. There will also be groups available covering your particular job discipline, alumni, and company groups for current and ex employees. We would recommend that you join at least ten relevant groups. Food Careers manage a very active group on LinkedIn where Food professionals discuss market trends, company news and the state of the jobs market. If you would like to join our group, just send us a request on LinkedIn. Being proactive and maintaining a positive online identify is increasingly important and time spent on LinkedIn cultivating your online persona, sharing experiences and contributing to discussions will be time well spent, as employers latch onto the benefits of social media as a cost-effective candidate engagement tool. Another tool at your disposable and available for free is Twitter. Job seekers can quickly set up a profile and can use keywords within their profile which will have relevance to their past experience, type of job they are seeking, previous job title, and other buzz words that will help them get noticed. Brevity is a byword for Twitter though, as you only get 140 characters to use on your profile. You also get one link which we would recommend you use to link to your LinkedIn profile or your online iProfile CV. It is possible to link to your Blog or Facebook page but we would not recommend this, as it is much better to link to a portal that will provide the viewer with some information on your career history and achievements. As with any social media, with Twitter you need to commit to make regular tweets and keep your tweets Food related focusing on news and developments and other useful snippets of information relevant to the sector. People can also re-tweet your tweets causing them to go viral amongst your online community of food industry professionals, creating fantastic exposure. A good tip that will help put you in the right place is to follow people on Twitter who work in your sector, follow companies within your sector and stay active to let key influencers know that you are available. You can use Twitter to find companies within the Food sector and then follow them. You can also use LinkedIn to find relevant contacts, recruitment managers, talent acquisition managers (at corporates) and then follow them on Twitter. Quite often, companies will look to save cost on print media and online job boards so they will place job adverts on Twitter first. You may therefore gain the advantage of getting your job application in early, before it is advertised to the wider market and if you are a strong candidate this may negate the need for the company to advertise the role more widely. I would highly recommend following up any application made via social media (or company career portal) with a phone call as this really can work wonders and will separate you from your competition. When making a follow up call, if you can get through to the decision maker, try and broker an interview for yourself. It may sound pushy, but this is your career and livelihood so go for it. With new services and third party job search apps coming available for Twitter on a weekly basis, candidates can also use it to distribute your CV, find job postings and network successfully using bite size snippets. Also, don't forget to check out the Facebook jobs portal which will be going live at the end of 2012. Developing a Blog is another way you can demonstrate your intellect, insightfulness and knowledge of the Food industry. There are a number of websites where you can sign up to a free blog and share your thoughts with industry professionals and other like minded individuals. You may even gain blog followers who could be potential employers. You can also link your blog to your LinkedIn profile. Another idea is to follow the blogs of employees of companies where you would like to work. Post comments to them and invite them to follow your blog. You can also use Twitter to promote your blog and gain more blog followers. You can also place a link to your blog on your LinkedIn profile. Followers of blogs thirst for content so try and update your blog on a weekly basis. Stick with it, as successful blogs tend to be well-established, regularly updated and content rich. Your blog is also your shop window to a prospective employer so keep your blog positive and humorous as no one will employ a gloomy cynic! Although it takes effort, creating a blog will separate you from the uninspired job seeker and you’ll be seen as someone dynamic and knowledgeable enough to voice their opinion and stimulate discussion on your field of expertise. Although this article covers some of the online resources available to job seekers, don’t get so immersed in social media that you negate traditional lines of communication. A successful job searching plan will incorporate a number of methods, so think about making a call rather than writing an email, go and visit an ex colleague you said you would keep in touch with when you left your last company, take that customer up on the offer of lunch and don’t be afraid to ask for a recommendation or lead. Remember that it may take time to see the fruits of your job searching labour, and building relationships and developing your network is a gradual investment of your time, but an investment worth making.